I watched this movie 3 weeks ago. I have my doubt at first because some said it is the same disaster as Tim Burton's Alice in Wonderland. It made me hesitate because I don't like that movie (even thought I was really eager to watch Alice in Wonderland at that time. What a disappointment). But anyway, despite the mixed review from the critics, I still think this movie is good. I even shed some tears in the cinema, but probably it's just because I was in my PMS (Pre-Menstrual Syndrome) so I'm pretty sensitive. The music, cinematography and production design of this movie is quite good. Angelina Jolie is really good in this movie. Menacing and cool at the same time. The story is simple and sometimes I think the character development is so sudden that it seems a little bit forced. The thing is, they change almost everything you know about "Sleeping Beauty". 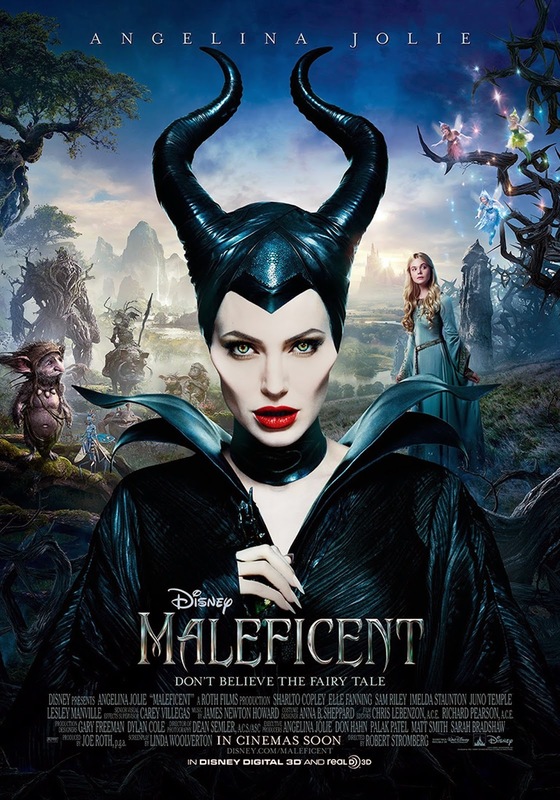 They rewrite the history of Maleficent. The movie tag is "Don't Believe The Fairy Tail", after all. So anyone who love the original story and doesn't want it to change might have a bad time with this movie. I read Sleeping Beauty when I was a child but I don't mind the twist in this movie. In fact, I quite love the twist! What I don't like is they change the personality of the 3 good fairies, from wise to ridiculous. The ending is also too convenience. I wonder if Aurora is so forgiving that she will overlook the fact that Maleficent kill her father. Oh, geez. Why I have issues with almost every Hollywood movie ending that I watched in May? Overall, I still recommend you to watch this movie. The story is really average but the visual is pretty. Have you seen it? Comment below and let me know your opinion! Nice review. Wish there was more to this movie than just pretty visuals and a fine performance from Jolie. Thank you! Not the kind of movie that I would watch over and over again, but I still think it's good due to Angelina Jolie's performance.